Mooney on Theatre is giving away tickets to a performance of Escape from Happiness at Alumnae Theatre (70 Berkeley Street) on Thursday, October 2 at 8 pm. 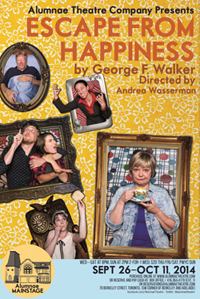 To be entered into the draw for a pair of tickets just send an email to contests@mooneyontheatre.com with the subject line “Escape from Happiness” by 11:00 pm on Monday, September 29, 2014. A bizarre event in a dysfunctional family prompts an incident of brutality in this intensely dark Canadian comedy. This play explores the most tender moments at the most violent of times. Nora Quinn (Heli Kivilaht) is the head of an eccentric, working-class family fighting alcohol, drugs, corruption and organized crime in their dangerous, impoverished neighborhood while trying to manage the turmoil in her own house. Eldest daughter and protector Elizabeth (Andrea Brown), middle child Mary Ann (Lesley Robertson) whose sunny disposition is maintained through constant cooking, youngest daughter, and new mother, Gail (Renée Haché) who desperately tries to help her family mend their past, Gail’s husband Junior (Maxwell King) who has “bad luck following him like a best friend”, and their recently returned father Tom (David Cairns) who may or may not be the abusive, uncontrolled ex-cop he once was round out this unruly family in Escape from Happiness. Throw in ambitious ladder climbing police officer (Joanne Sarazen), her reluctant partner (Ryan Seeley), and father and son criminals (Robert Skanes and Colin MacDonald) and anarchy prevails. Performances run Wednesdays through Saturdays at 8 pm with Sunday matinees at 2 pm. Tickets are $10 on Wednesdays, $20 Thursdays through Saturdays and cash only PWYC on Sundays. Tickets can be purchased online or at the door.